Ladies and gentlemen. On our trip down the Great River, we have been looking forward to meeting some of the characters that make it their home, either temporarily (like us) or permanently (like some of the river boat captains, chandlers and fishermen). On the first day from Itasca, we met a couple of guys, poling their canoes upstream to catch minnows in order to fish for the famous Minnesota walleye (a kind of pike). They were really friendly, but looked like they were straight from central casting – bearded, untroubled by teeth and wearing clothes that were strangers to the laundry room. They had recently seen my wife Julie and regaled her with stories of people dying on the river, stuck up to the neck in Mississippi mud and perishing horribly. Naturally, Julie was enormously cheered by this on day 1!! So today we encountered one of the true characters of this trip, a slightly “unhinged” (like us!) but hugely kind and entertaining Belgian, splendidly called Ewaut Van Wassenhove. We had seen him a few times over the past couple of days, paddling his Grumman aluminium canoe solo, weighed down by all his gear but always smiling. 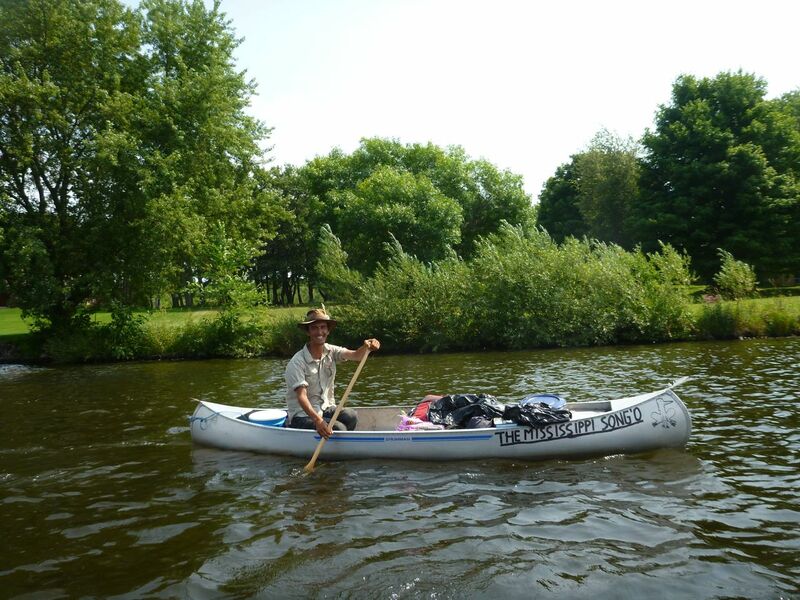 We had learned that he was also paddling to the gulf and today, by chance, we happened to reach the end of our 22 mile session as he reached the same portage point. We helped him out of the water and offered him a sandwich and a drink. He was hugely grateful and sat happily chatting to us for a while. 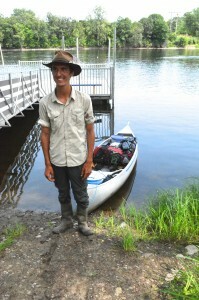 He is 21, skinny as a rake, with a fabulous hat, safari shirt and trousers and a big pair of green wellies. Couldn’t make it up. He told us he had started on March 17 in Ghent, hitchhiked to Cambridge and began camping wherever he could. He went from there to Ireland and thence to Canada for a while. He went to the source of the Mississippi, bought a canoe, paddle and some gear and set off for the gulf. After New Orleans, he intends to head to Texas then Arizona and then down to South America before returning to Ghent. Amazing. I asked him if he was staying in touch with his family and he said his biggest supporter was his dad, a fanatical aficionado of American Jazz and part time Lindy-Hop dancer. His dad had given him some contacts in Burlington, Iowa and New Orleans. So you get a picture of his background. I am a great believer in helping folk out as we go as we may well run into times when we need help too, so I suggested we should help our new friend with his portage. As it happens, this would have taken him a whole day, given the distances and the amount of gear he had. He was delighted to accept and we duly took him and we agreed that we would look out for each other down the river. He then said that he will aim to get to New Orleans at the same sort of time as us. He then showed exactly why it is right to spread goodwill whenever you can. Ewaut said that even if we didn’t meet in New Orleans, he would sell his canoe and canoeing gear and put the money into the Mississippi Million. And all we gave him was a sandwich, a drink and a lift. That, my friends, is why this trip has just a little magic about it and I hope that you are managing to feel just a little of its magic through these stories. John, it all seems to be going rather smoothly. I wish I could say the same about my training here in Singapore, but I am making progress. Looking forward to joining you in October, and well done indeed. It is an exciting project to be involved in. Will someone please write a book at the end. What a fantastic time you are having I am very envious !! Good luck and it is all for a great cause! Just a tiny bit of trivia – the walleye, while called a pike by some, is actually a perch. Here in Minnesota what we call pike are the Northen and Muskie varieties of true pike. If you decide to fish for pike while you’re here, never ever grab it by the gills (the gills have teeth too!) or by the lower jaw like you might with other fish, they will slice you like razor blades! Think upper Midwest piranha! They also don’t fight like other fish. They will drop to the bottom and feel like you snagged a log. When you get to bluff country in south east MN/WI (which is breathtakingly beautiful, btw) know that you could encounter rattlesnakes in the rocks. Not very common, however, and the only part of MN with venomous snakes. And, I think, the only things you’ll have to worry about until you get south where the alligators are, and even then they will likely avoid you. So fun to follow your adventure! Please stay safe, this river isn’t to be taken for granted, as you’ve discovered. Ps, met you in Grand Rapids at the hotel. Thank you again! That’s my ‘little’ brother!!! So nice to read this and see some pictures of him in his magical canoe! You’ve described him exactly as he is!!! Thank you! Glad to see my friend Ewaut is doing fine and has the chance to meet other fantastic people! Also: I secretly read this sometimes to remind me of those amazing times on the mighty river and to remind me that some things that sound crazy are totally doable if you break it up in little steps!